Unfold 1 pastry sheet on a lightly floured surface. Roll the pastry sheet into a 12-inch square. Prick the pastry thoroughly with a fork. Cut into 12 (2 1/2-inch) circles. Repeat with the remaining pastry sheet, making 24 in all. Press the pastry circles into 24 (2 1/2-inch) tart pans. Refrigerate for 20 minutes. Place a piece of aluminum foil into each tart pan. Add dried beans or pie weights. Place the pans onto baking sheets. Bake for 15 minutes or until the pastries are golden brown. Remove the foil and beans. Remove the pastries from the tart pans and let cool on wire racks for 10 minutes. Heat the heavy cream, corn syrup and butter in a 1-quart heavy saucepan over medium heat to a boil. Remove the saucepan from the heat. Stir in the chocolate and liqueur. Let stand for 5 minutes. Stir until the mixture is smooth. Let stand at room temperature until set. Spoon or pipe the chocolate mixture into the pastries. Sprinkle with the confectioners sugar, if desired. For Chocolate Raspberry Tartlets: Substitute 1 tablespoon raspberry-flavored liqueur for the coffee-flavored liqueur. 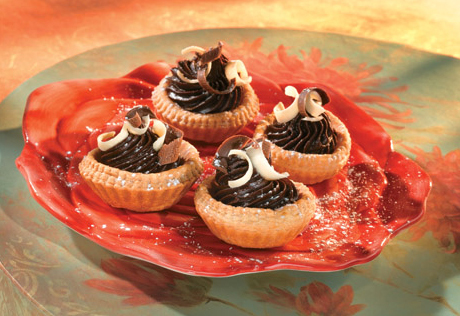 Serving Suggestion: For a special-occasion look, top the tartlets with small white and dark chocolate curls.